Saturday was so busy I forgot to write a blog entry! On Friday evening the Amphipod trap was recovered. There was a good haul of the carrion eaters. which are generally quite small (up to 5cm) in this area. 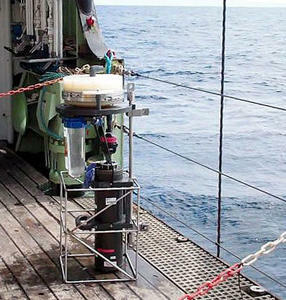 The trap was redeployed on Saturday to give a second set of results. The SAPs (Submersible Autonomous Pumps) were deployed again too. I pictured one on deck about to be strapped to the wire and then submerged. Three are strapped to the same wire at intervals which mean they will pump water through filters at 200, 400 and 500m. The filters are then preserved for later analysis. Most of the afternoon was devoted to deploying the PAP3 sediment traps, which I had helped to prepare and program in the morning. It was a long process as the mooring around 2000m long with two sediment traps at 3000m and one trap at 100m above the sea bed. Disappointingly the PAP3 mooring inexplicably (so far) resurfaced so the team had to recover all the parts ready to try again on the Sunday. The Mega core team are still taking samples over night and the underway sampling continues, some constantly and some only when the ship is not holding station. Late in the evening the team were working hard getting the sensors prepared for the PAP1 deployment on Sunday, so I was lending a hand too until quite late.